Pyeongchang, the host city of the 2018 Winter Olympics, will launch a winter classical music festival from 2016, said organizers of an annual summer music festival there. 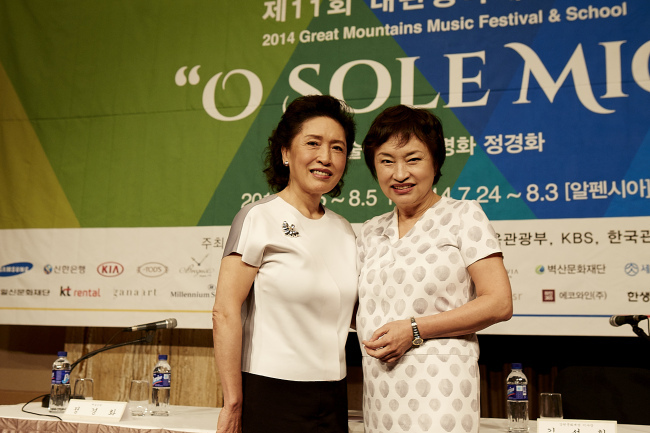 Chung Myung-wha and Chung Kyung-wha, sisters and co-artistic directors of the Great Mountains International Music Festival & School, revealed the plan at a press conference in Seoul on Monday. “All I can share with you now is that it will start from 2016,” cellist Chung Myung-wha said. “Pyeongchang and the (surrounding) Daegwanryeong area are beautiful in summer, but they are also beautiful in winter,” she said, stressing the town already has everything required for a classical music festival, having played host to the Great Mountains festival in the summer for the past 10 years. Mixing beautiful nature, laid-lack ambience and great music, the Great Mountains festival has transformed Pyeongchang, a small town in mountainous Gangwon Province known for its many ski slopes, into a dream vacation destination for classical music lovers. This year’s festival runs from July 15 through Aug. 5, with the theme of “O Sole Mio,” highlighting music from southern Europe ― namely Spain and Italy. “People usually would go to chamber music concerts in the evening after work. Then, sometimes, chamber music is little hard to enjoy,” Chung said. Chamber music is a form of classical music performed by a small group of musicians at a small venue. But in the festival, people leave their daily stress at home and listen to the music in such a beautiful and leisurely setting, she added. For violinist Kyung-wha, this year’s theme touches upon a core part of classical music tradition. “There is no talk of music without mentioning Italy,” she said. Artists participating in this year’s festival include Spanish flamenco dancer Beln Cabanes, conductor Antoni Ros Marb, guitarist Xuefei Yang, soprano Kathleen Kim, mezzo-soprano Elizabeth DeShong, violinists Svetlin Roussev, Clara-Jumi Kang, Kwun Hyuk-joo, cellists Jian Wang, Llus Claret and pianists Kevin Kenner, Kim Dasol and Kim Tae-hyung. The Chung sisters will also perform. A total of 12 concerts will take place at the Alpensia Resort in Pyeongchang and another 10 at various venues in other cities of Gangwon Province. For more information about the festival and its programs, visit http://www.gmmfs.com.